That sound you hear? It’s the sound of a thousand people screaming in sheer delight and amazement because Disney and Lucasfilm just released the first look at the upcoming Solo: A Star Wars Story. The movie opens in 109 days, and our first look is only just happening *now*. But if you’ve been following the drama surrounding Han, you probably know why this first look has been hella delayed — like how the directors were fired midway through and replaced with the narrator from Arrested Development. But you know what, that is neither here nor there right now because we have to get back to freaking out about HAN. SOLO. 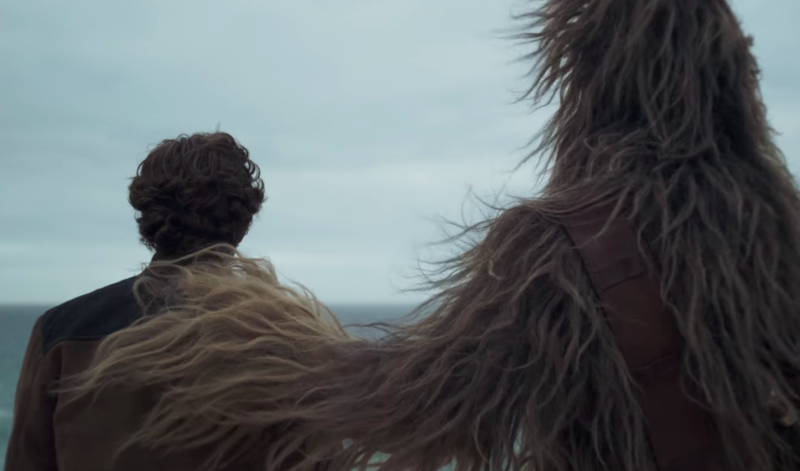 While the trailer doesn’t exactly give anything away about the actual movie, let alone the plot, it’s a beautiful first look at what we’re going to see in the upcoming stand-alone Star Wars story. It looks a whole lot like the dark and gritty Rogue One, but it has way more ships, way more meaningful looks, and Emilia Clarke. Oh, and Donald Glover as Lando Calrissian, so excuse me while I go freak out for the next 109 days about this. This is just a teaser for the movie, as the full version will drop Monday morning on Good Morning America. So set your alarms and wake up early, because you’ve got a date with Han and Chewie.